How it looks It looks pretty good, for the money. The clear barrel shows off the ink colour in the cartridge rather nicely, and it looks like it it’s going to be a fun thing to pick up and play with – which, actually, it is! How it feels With the cap on, we think it should be about the right size for most people’s needs, and it posts fairly securely so it feels reasonably robust too. It’s very light indeed – the other end of the scale from the chunk of heavy metal we reviewed last week – but that’s often good news for beginners. 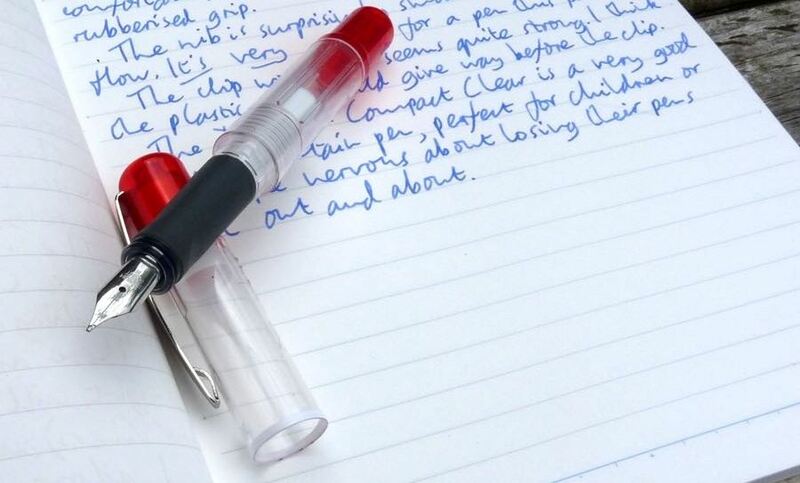 The rubber section is slightly shaped to add good pen posture, which is again quite helpful for anyone getting to, err, grips with writing properly. It feels comfortable to grab and have a go with. How it fills This is a straightforward whack-in-a-cartridge job, and for the likely purposes of most owners that should be ideal. The blue it comes with is perfectly adequate, and of course there are many tempting alternatives from Diamine which we’d recommend. VFM For a beginner’s fountain pen. this is just about the best value for money there is. High-street stationers will sell you pens which perhaps look a little shinier on the outside for only a little more, but for £10 this has everything a budding scribbler could need; that Bock nib really is built to take some abuse and still write well, and we suspect (although for obvious reasons it has been neither confirmed nor denied) that the body is made by Diplomat. So it’s both Geordie and German, and should be flying off the shelves as an export if there’s any justice in the world… Auf Wiedersehen, Pen. If this isn’t quite your cup of tea, but almost… then other purveyors of appalling puns based upon 1980s television comedy dramas are available. But, getting back to the Dex compact, the diminutive size might be the one thing that puts off some potential purchasers, but the larger Dex ‘soft’ model solves that quite easily. Where to get hold of one Obviously, enough, from the Pen Shop. You can drop into one of their bricks-and-mortar establishments if you wish, or order direct from their website. 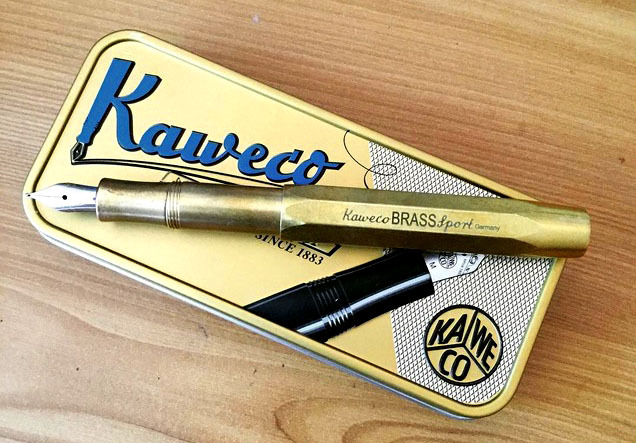 A little bit of history Kaweco go back a long way, and this design does too – to the 1930s, in fact, by way of a few company ups and downs and a rebirth via the Gutberlet family. The Sport remains a classic, and a rightly popular one – it’s the pen that the term ‘small but perfectly formed’ could have been coined for. 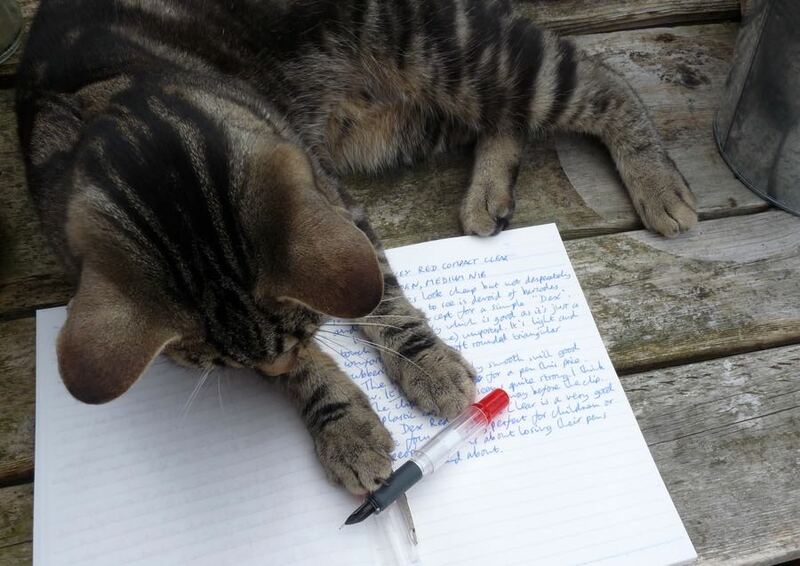 Our first reviewers all have their own Sport story; Ian Hedley actually got started in fountain pens with one, Scribble Monboddo’s review of a basic plastic Sport ‘Classic’ is one of his most frequently-read posts, and Ruth Hanson has promised never to get it mixed up with the lipstick ever again… but they have all been impressed already. 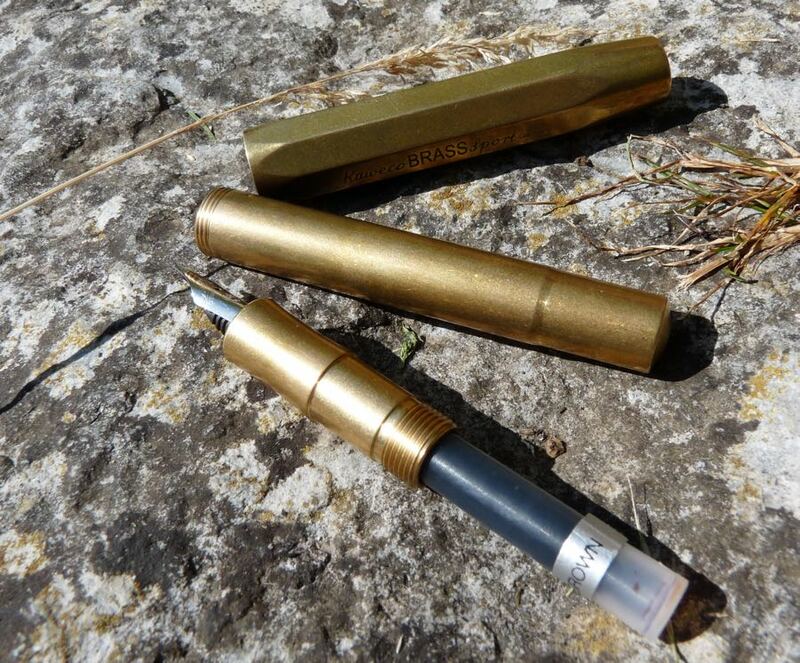 So when Kaweco offered United Inkdom the chance to review the new nakedly-brass Sport, well, how could we refuse? How it looks It looks seriously handsome, and we’re unanimous about that. The plain brass finish isn’t plain at all; it does very bouncy things to reflected light, and with regular use it will take on a well-loved sort of patina. So few manufacturers have had the courage to use plain brass without hiding it behind paint that it also looks seriously distinctive – that shape, in that colour, with that shine, and it could only be one thing. Frankly, we’re all smitten. How it feels In a word, heavy. But in a good way. Brass is not the lightest metal, and the cap, barrel and section are each lathed from solid blocks of the stuff. 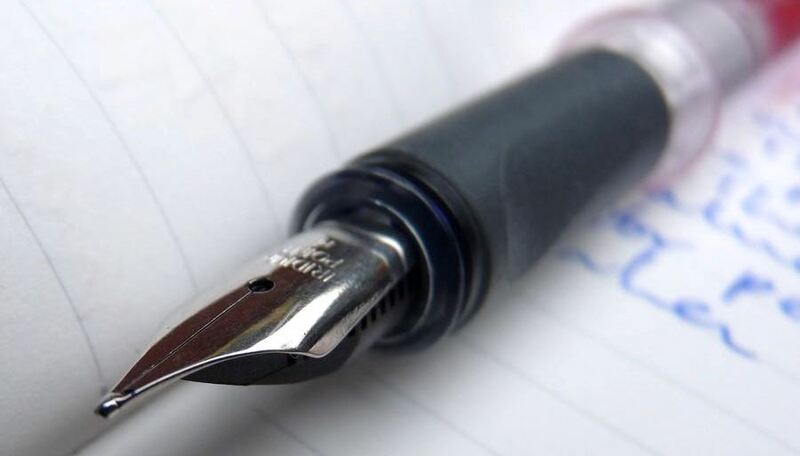 As this is such a small pen, the weight is pretty much perfect; you certainly know the pen is there when you pick it up, but it isn’t tiring to write with. In our view, it’s spot on. How it fills Now this is a small pen, and that involves some sacrifices. If you want exotic filling systems, a miniaturised pocket model is probably not the place to start! There is space only for a small international cartridge, but that’s not such a bad thing; there are many good ink-makers producing pre-filled cartridges these days, and getting any ink of your choice into one with a syringe is really not so difficult. There is a tiny squeeze converter available too, but the ink capacity is so minuscule that we wouldn’t bother. VFM While not exactly a cheap pen, the brass body itself is excellent value; it’s solid, comfortable, and the appearance will gradually change to a nicely ‘vintage’ look with extended use. None of the three reviewers have any intention of letting this leave their collections (or indeed, their persons, it seems!). 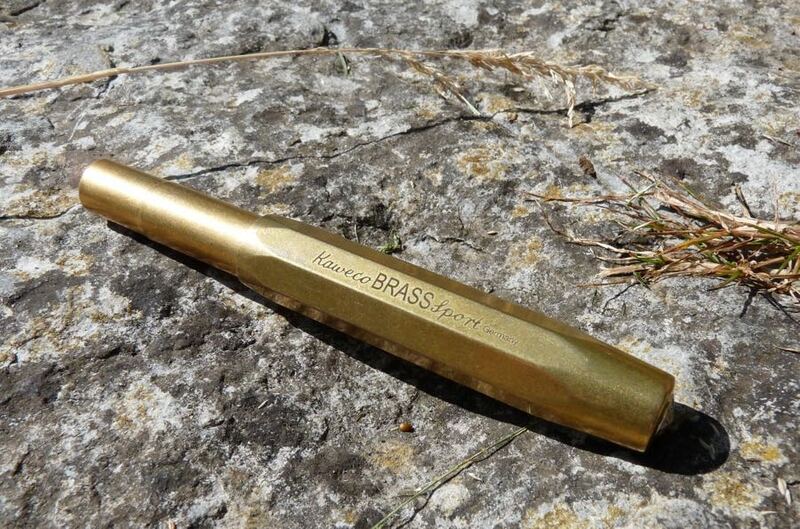 So the Brass Sport looks like great value for money at its standard retail price. The balance sheet looks a bit more questionable when the gold nib is added as, lovely as it is, at the moment it can only be obtained as an expensive add-on accessory; it’s currently on sale for £99 in the UK, which is £34 more than the pen itself costs, and that’s difficult to justify. We have suggested that Kaweco consider how to ‘bundle’ the pen with a gold nib ready-fitted at a more attractive price – and the CEO is exploring the options to do just that. If this isn’t quite your cup of tea, but almost… Then take a look at the Lilliput, another Kaweco model which The Pen and Inkwell will be reviewing soon. Our overall recommendation Go ahead and get one; you won’t regret it. That goes for any of the standard steel nibs, at least. 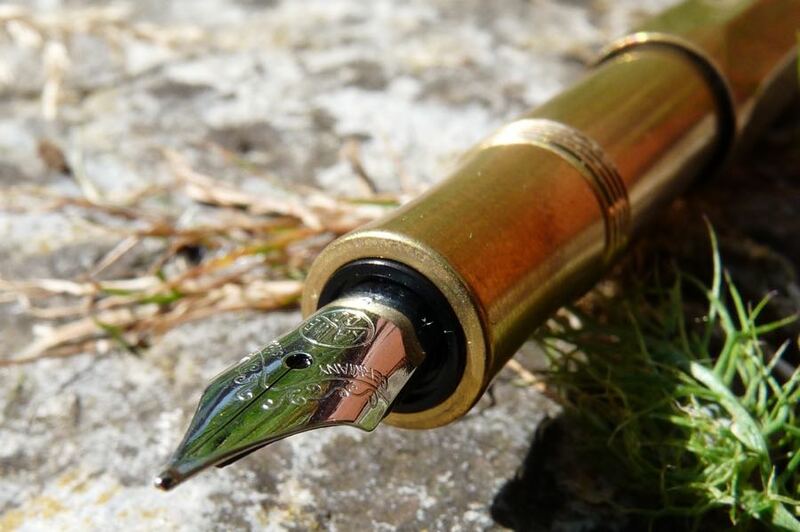 For the gold nibbed-version, we’d suggest holding on for just a little longer; once Kaweco and their retailers have had an opportunity to combine brass and gold as a more reasonably-priced package it will become an irresistibly attractive option. Where to get hold of one We’d advise buying from a specialist pen retailer; in the UK, Kaweco is stocked by several of the best including The Writing Desk, Cult Pens, and Andy’s Pens, all of whom know their stuff. Thanks to Kaweco for lending us the Sport (and subsequently helping us find a way to keep them, as we all like them so much!) – that doesn’t influence our meta-review, but we do appreciate it.